A young Israeli whose family immigrated to Brazil was studying to be a rabbi. The rabbinical school happened to be near a Benedictine monastery, where one day the young man heard the monks chanting the Hebrew psalms. Fascinated, he ventured closer. Wanting to learn more about the men who prayed the psalms so beautifully, one day the Jewish man introduced himself to one of the monks. As their conversation deepened, the monk told the young man of Jesus, the Messiah. Some months later, the student was in Rio de Janeiro when, passing by a large Catholic church, he was drawn to step inside. He walked in and made his way to the front of the sanctuary, where there hung a larger-than-life crucifix. Standing in front of the cross, he said aloud to the crucified Christ, “Tell me if it is true. Are you the Messiah?" One of the most remarkable American Catholics of the last century was a humble Capuchin friar whose name in religion was Father Solanus Casey. Solanus served as a friar in Detroit, in New York, and in his final years in the town of Huntington, Indiana. Born of Irish parents, Solanus did not fare well in the seminary, where he was taught by German-speaking priests in Latin, so while he was ordained a priest, he was never allowed to preach a doctrinal homily or to hear confessions. Yet God gave Solanus the gift of healing, and people sought him out from all over. When he died in 1957, those who knew him regarded him as a saint. He now is recognized as a Venerable, the last step before being beatified by the Church. Solanus was the community’s porter, the doorkeeper. Today we would call him a receptionist, someone who would greet visitors who came to the friary seeking prayers or material comfort. Solanus did his job so well that people lined up to have a few moments of his counsel. People of all faiths would come to him requesting prayers and healings. What Solanus would ask of these seekers was rather unique. He told them to “thank God ahead of time”—in other words, to step out in faith, before any miracle had happened; to act before God as though it already had happened. The way that he normally asked people to express this thanks to God was for them to sign up to have Masses said by the Capuchin mission society, whether they were Catholic or not. Mass is the perfect “thanksgiving,” so it made sense to Solanus that if one were to thank God ahead of time, having Mass said was the perfect way to do this. People continue to seek Solanus’s intercession to this day, and they continue to “thank God ahead of time,” with remarkable results. What Solanus taught is what Jesus practiced. 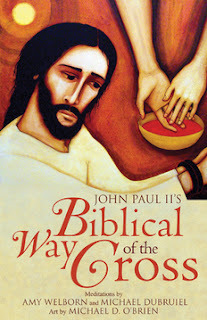 In John’s Gospel, before Jesus is arrested and crucified he thanks God, ahead of time. He trusts the Father entirely and he teaches his disciples to do the same. While the people are divided over Jesus and seek to arrest him, no one is able to lay a hand upon him until he gives himself over to them. He freely gives himself to the Father as the Father gives the Son to the world and as the Spirit will be given by the Father and the Son to those who believe and put their trust in God. The Spirit will unite what sin has divided. John’s Gospel tells us that “they wanted to arrest him,” but instead they were captivated by him. They were as divided in their purpose as we are when we sin—part of us wants to believe, part of us doesn’t. Division is one of the results of the original sin of Adam and Eve—and the cross of Christ is the ultimate sign of division, but ironically in that very cross, Christ will make us one. Do we see this unity anywhere on earth today? In some ways we are more one now than we were fifty years ago, but in many other ways we are more divided. It is to be expected that the world is this way, because the world will remain fallen until Christ comes again, but it is a great scandal that division exists within the body of Christ—the Church. We cannot here worry about what someone else can do to undo this damage to the body of Christ, this further tearing apart of his flesh—we can only examine what we are doing to repair the damage ourselves. When the Scriptures speak of love there are three different words used that are all translated in English as “love.” There is eros, which is a romantic love; sometimes this word is used for the love that we should have toward God and that God has toward us. There is philia, the love of friendship; again, this is used both for the love that God has for us and for the love we are to have for God. Yet the most common form of love, the type of love of which Jesus spoke when he said that we should “love the Lord with our whole being” is agape, a sacrificial love—a tough love, a love that can almost feel like we are being crucified. In the spiritual life, there are times we find ourselves on a spiritual high, literally in love with God. There are other times we experience God as a trusting friend to whom we open our hearts, and with whom we feel solidarity on our life’s journey. Yet for all the other times, there is agape—sacrificial love! Agape love is tough. It’s how we love our children who are driving us nuts, how children love parents, or how spouses love each other, even when the other person doesn’t respond to every need. It’s the type of love we have for our enemies. It can even be the type of love we have for ourselves when we are immersed in feelings of despair and failure. It is the type of love we are to have for God all the time. Yet most of all, it is the type of love that God has for us. The kind of love that induced him to lower himself to our level, suffer at our hands, and love us through it all. 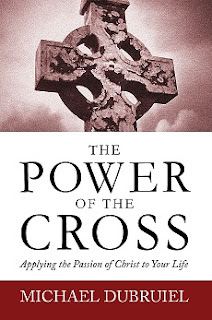 The cross is the school of love. It transforms how we look at God, the world, and everyone around us. Nailed to the cross with Jesus, we sometimes have faith enough to hear him promise, “This day you will be with me in Paradise.” Others simply curse God for not taking them down off of the cross. If you are graced to be a student of the cross, it is your mission to pray with all of your strength for those who are truants of this school. The love of God compels us to love one another, 118 The Power of the Cross God has already lowered himself to our level, suffered at our hands, and loved us through it all. Jesus is the perfect example of being loved by God and loving God. Realizing that God alone really matters is the first step to entering the kingdom of God. When that kingdom comes, everyone will acknowledge God’s priority. Until then, we live in a world where those who know must tell those who don’t, and oftentimes those who know best are the children. Fulton Sheen once said there will be only children in the kingdom, something that we adults might want to reflect upon from time to time. A young girl dying of cancer befriended a famous archbishop. The bishop had a soft spot in his heart for children like her; his own niece had been diagnosed and he knew firsthand the agony both the patient and her parents faced. The archbishop had extended a standing invitation to the Protestant chaplain of the children’s hospital: If any Catholic child in the cancer ward wanted to see a priest, he should be summoned. So it happened that the archbishop was called to accompany this young cancer patient, Lorraine, in her last months of life. In time Lorraine came to trust the archbishop, and she shared with him her greatest trial. Her parents were angry with God because of her illness. She had been diagnosed when she was five years old, and had not yet made her First Communion. Would it be possible, she asked her friend, to receive the Eucharist before she died? After consulting with the parents, the archbishop prepared her personally for her first reconciliation, then celebrated Mass in her hospital room, confirming her and giving her First Communion. She lived only a short while longer. The archbishop said she had great faith but her constant worry was her parents. No doubt she was now interceding for them, that they might come to know the love that she had experienced in her suffering, that same suffering that had become an obstacle of faith to them. This is the obstacle of the cross—when Our Lord died on the cross, some left believing that he was the Son of God, others left in utter disbelief. Yet the Scriptures tell us that Jesus’ death on the cross was a sign of God’s love.